"A variety o marine wirms": plate frae Das Meer bi M.J. Schleiden (1804–1881). The Polychaeta or polychaetes are a paraphyletic cless o annelid wirms, generally marine. Each bouk segment haes a pair o fleshy protrusions cried parapodia that bear mony bristles, cried chaetae, which are made o chitin. As such, polychaetes are whiles referred to as bristle wirms. Mair nor 10,000 species are descrived in this cless. Common representatives include the lugwirm (Arenicola marina) an the sandworm or clam wirm Alitta. ↑ 1.0 1.1 Struck, T. H.; Paul, C.; Hill, N.; Hartmann, S.; Hösel, C.; Kube, M.; Lieb, B.; Meyer, A.; Tiedemann, R.; Purschke, G. N.; Bleidorn, C. (2011). 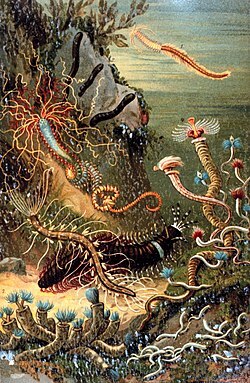 "Phylogenomic analyses unravel annelid evolution". Nature. 471 (7336): 95–98. doi:10.1038/nature09864. PMID 21368831. This page wis last eeditit on 24 Mairch 2017, at 03:21.